Boxes Gable Glossy or Matte 6 x 4 inches. 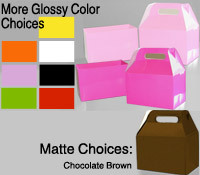 Glossy or Matte (chocolate brown) Gable Gift Boxes can be used as closed box or fold down flaps and becomes an open top box for gift giving. For the open top gift box, just add some shred, place the gift inside, the wrap it with cellophane bags, cello roll, basket bag or shrink wrap. Versatile box so you can wrap lots of different items lots of different ways. We call this a 6x4 gable box and the actual size of this box is 6.25" wide x 3 7/8" from bottom to top of first fold (as an open top box) and 6.25" high when folded as a gable gift box. 3 7/8" deep. 12 boxes per pkg.